The first weekend of Premier League action was witnessed over the weekend, with Manchester United kicking off the season with a narrow 2-1 victory over Leicester City at Old Trafford. Maurizio Sarri got his Chelsea managerial tenure off to a winning start, with an emphatic 3-0 victory away to Huddersfield at the John Smith Stadium, while Unai Emery became the first Arsenal manager in 31 years to lose his first league match. Pep Guardiola and Jurgen Klopp also got matchday one victories. We equally witnessed some amazing individual displays on an individual level, with Everton's record signing from Watford Richarlison being the pick of the lot, owing to his brace in the 2-2 draw against newly promoted Wolverhampton Wanderers at the Molineux. Sadio Mane also starred with two goals as Liverpool decimated West Ham 4-0 at Anfield, while Luke Shaw got the first goal of his professional career with an exquisite finish past Kasper Schmeichel of Leicester. There were quite a number of observations from the first matchday of the 2018/2019 Premier League season, here are six of them. Manchester City were utterly dominant in their Premier League title win last season, setting and breaking a plethora of Premier League records including most points in a Premier League season (100), most goals scored in a single Premier League season (109), largest goal difference (79), most victories in a Premier League season (32), most away victories in a single season (16), most away points (50), most points ahead of second (19), most consecutive victories (20) and most passes completed in a game (943). As a result of this, they began this season as favorites to be the first club to successfully retain the Premier League since city rivals United in 2009. However, The Premier League boasts a lot of top quality teams, and clubs such as Liverpool and Chelsea have spent big to refurbish their squads and strengthen areas of weaknesses. The strengthening by their rivals led many to suggest that City would not have such an easy stroll to the title again, and that Liverpool and Chelsea would give them a good run for their money. However, with their performance over the last week, the Cityzens have shown that they mean business once again this season. 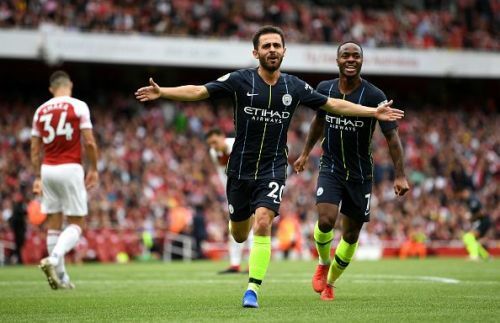 They were exquisite in their 2-0 victory over Chelsea in the Community Shield last Sunday and followed that up with a very controlled victory over Arsenal by the same scoreline at the Emirates in the Premier League. Arsenal are one of the strongest teams in the league at home, so Manchester City getting a victory away to them is no mean feat, especially coming in the manner in which it did. Guardiola's men were totally in control from the blast of the referee's whistle, and at no time did Arsenal look like they were going to threaten Ederson in goal, as City dominated proceedings from start to finish. Although Liverpool and Chelsea also had very convincing victories of their own, the calibre of opposition and manner in which Manchester City got their victory means that the Cityzens could very well hoist the EPL trophy once again come May next year.